What an amazing day. 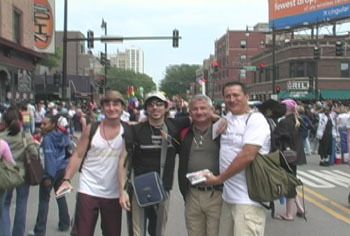 Here in Chicago we went out diffusing at the Gay Pride Parade, four dedicated Peace Warriors with our Prophet's beautiful Fatwa Of Love postcard, which sends our love not only to all the gay people in the world, but also to their persecutors, because obviously they need love too,or they wouldn't be persecuting. Alfredo, Eduardo, Peter, Sarah, and I Went out into the streets where there must've been - I don't know - half a million people? And we passed out Love postcards all day long, we passed out thousands, and we got incredible responses. We even filmed an interview with a representative of Amnesty International who absolutely loved the work (play! ) we were doing and said so on camera. (Look for her (and us!) on RaelTV soon!) She was so moved by the Fatwa of Love that she ended up hugging us all, and it was a moment that we really appreciated the beautiful work (play!) we are doing on this planet, spreading Love and the Freedom To be who we are. And to make the experience even better, our Raelian Brothers and sisters at the Gay Pride parades in Toronto and San Francisco were waging their love-actions at the same time, so we felt really connected to the whole continent. The Gay Pride parades are such fabulous places to be because there are so many people being who they really are freely without inhibition or fears of judgement, and having so much FUN doing it! I wish the whole planet was like this! Thank you dear Prophet for bringing me this beautiful hope. And I wish to share one other moment, that moment just before beginning Our playing, when, surrounded by the milling crowd, we all stopped, Eduardo, Alfredo, Peter, Sarah, and I, and we held hands, and we gave our thanks to our Creators for giving us the opportunity to see the potential that humanity has, the beauty and the richness. Thank you, Elohim. We love you.